Thanks for the comments all, and appreciate your detailed input Claus. I was also considering an additional line from Yaxell, the BD1N steel. I believe they come to a 63 on the Rockwell scale, and are solid vs. clad. Micarta handles. Still perusing the reviews, but so far looks promising. (02-27-2018, 09:07 PM)mike_the_kraken Wrote: Thanks for the comments all, and appreciate your detailed input Claus. I was also considering an additional line from Yaxell, the BD1N steel. I believe they come to a 63 on the Rockwell scale, and are solid vs. clad. Micarta handles. Still perusing the reviews, but so far looks promising. I believe Yaxell Dragon is a step down compared to Miyabi Artisan, to be quite honest. The blade profile and fit & finish aren’t quite up there with what you get in the Miyabi Artisan. If you want to go a step up in the Yaxell range, look for Yaxell Gou and Yaxell Super Gou. Yaxell Gou and Super Gou have flawless finish and blade profile. My favorites have been blue steel blades clad in stainless. The thinness makes them so special. Wicked sharp. Easy to Resharpen. The Petty’s are so good and sharp I hardly use larger blades for anything these days. Thank you, I now own 8 of these Miyabi Artisan knives, and they are a joy to use every day in the kitchen. I have tried some japanese knives and they just don't sit well in my hands. I own a few Lamson Sharp knives and absolutely love them. German steel, rosewood handles, and American made in Massachusetts. These are MUCH better than Wustof IMHO. German steel, American made ... good idea. Those look very nice. I should have seen this before ordering a German knife. Those Miyabi Artisan knives are beautiful! Just picked up the 5.5" santoku -- first kitchen knife purchase in decades. I just recieved a few Yaxell knives: a 8” chefs, 3.5” paring, and a 8.5” vegetable cleaver. Fit and finish are solid; apart from not having polished spines - there are no unfinished areas or perceivable transitions around the choil or rivets. Side note: you can buy the chefs knife in western style (pronounced belly, curved profile), or Asian (straighter, narrower profile). I prefer the latter (pictured above in a previous post) as I do more push cuts & slicing vs. rock-chopping with that particular knife. While I like the myabi artisan - it was the birchwood that really garnered my interest. 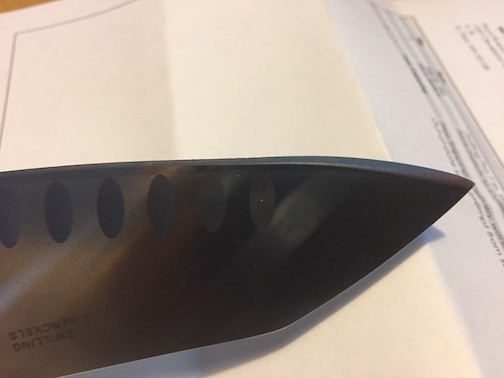 That said, I checked out some cut-tests that showed just average blade retention for the birchwood given its Rockwell rating of 63 (150< cuts). 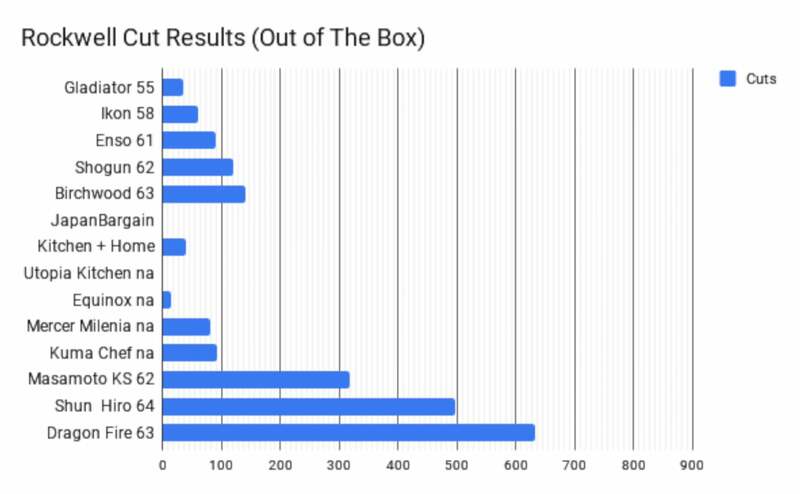 Consider that the Yaxell (dragon fire) got 600+ out of the same hardness rating, which is why I went the direction I did. Great Collection i Love your collection. Thanks. I wish I could afford more. I have the rosewood and it looks particularly beautiful when well oiled. (06-07-2018, 07:44 AM)asiliski Wrote: Thanks. I wish I could afford more. I have the rosewood and it looks particularly beautiful when well oiled. 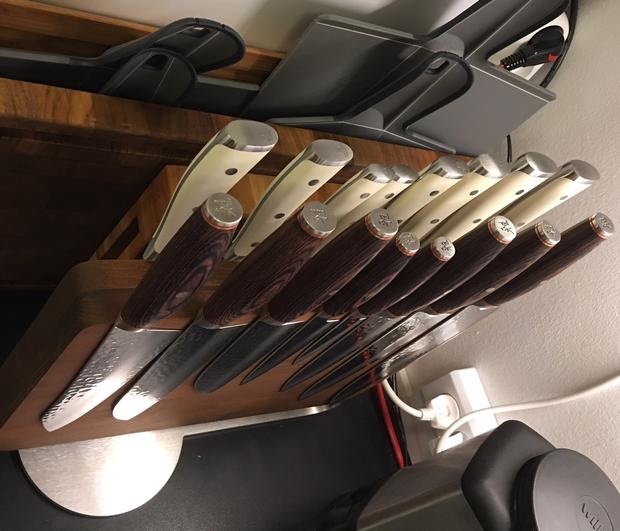 (02-27-2018, 07:28 PM)Viseguy Wrote: I have a set of Henckels knives ranging from 10" chef's on down that have been going strong for 40 years. I have two Mac 8" chef's knives that are a mere 33 years old. Granted, this doesn't say much about the current quality of these brands, but if you can find NOS versions from this generation, I'd say give it a go. My parents gave me a set of Henckels knives going on thirty years ago. I’ve honestly never thought to look for anything else. I added one from the generation following my originals, and haven’t had a need for another knife. I don’t know about the modern day quality of Henckels, but simply from the prices, it would seem they expanded into a lesser quality market. Are they now a “Get what you pay for” type of brand, or are their more expensive lines overpriced for what you get? I was going to chime in that I love my Wushtof Ikon creme chef knife and paring knife. Then I read all the posts in this thread and realized you already have more knives than I have dreamed of having. Haha!! Enjoy your collection mate! I have since then further added to my knife collection. 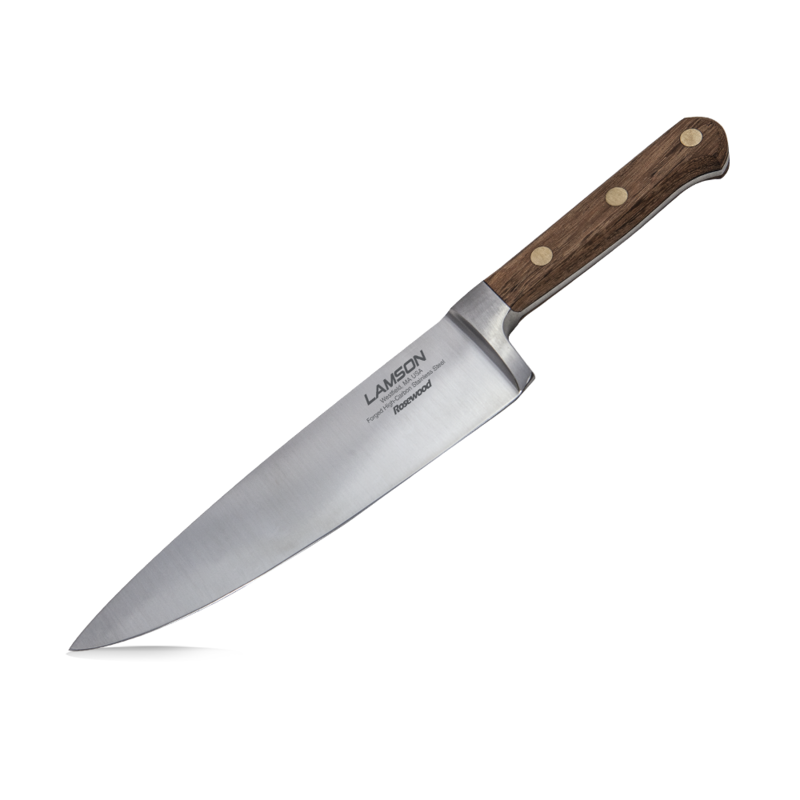 I bought a new Wüsthof Knife block in black ash wood that can accommodate 10 knives, so I bought the small 16cm/6” chef knife and the 9cm/3½” paring knife in the Classic Ikon creme series so that I now am the proud owner of 10 Wüsthof Classic Ikon Creme knives. They are great work horses in my kitchen for the rougher tasks. I also will add further 2 knives to my Miyabi Artisan/MCT 6000 line soon to also own 10 knives from that series. 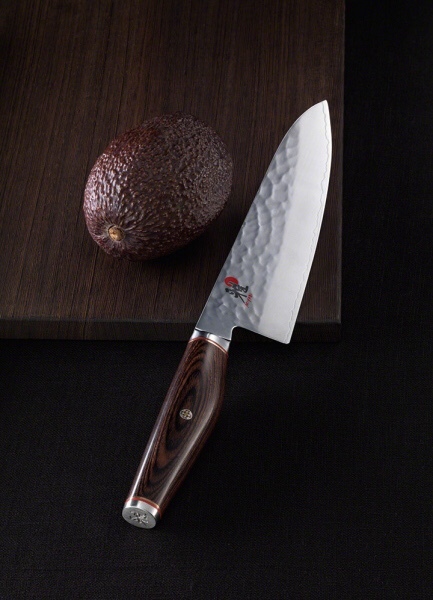 My next purchase will be a 20 cm chef knife and a 18 cm santoku knife from the Miyabi MCT 5000 Ashwood line, they have a 67 hardness on the Rockwell scale. The handles in this series is quite small and lightweight so these two knives will mostly be for finer chopping and also just to be able to admire them on a daily basis in my little home kitchen. 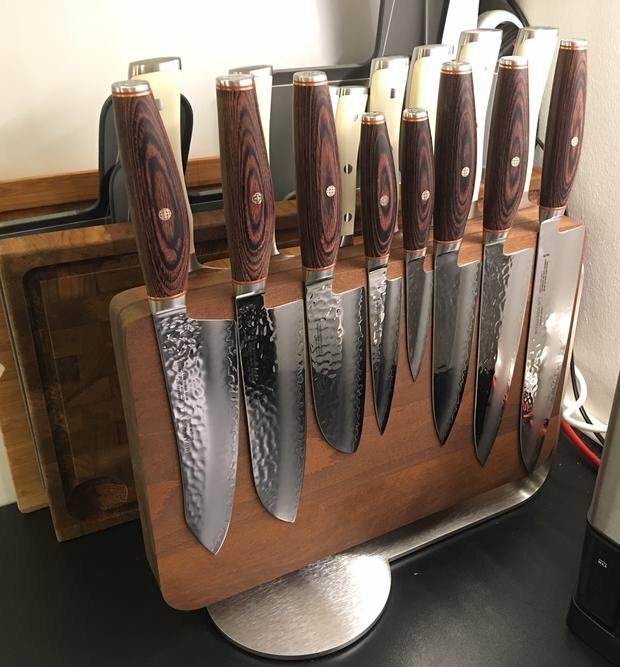 (03-09-2018, 10:49 PM)mike_the_kraken Wrote: I just recieved a few Yaxell knives: a 8” chefs, 3.5” paring, and a 8.5” vegetable cleaver. Fit and finish are solid; apart from not having polished spines - there are no unfinished areas or perceivable transitions around the choil or rivets. Side note: you can buy the chefs knife in western style (pronounced belly, curved profile), or Asian (straighter, narrower profile). I prefer the latter (pictured above in a previous post) as I do more push cuts & slicing vs. rock-chopping with that particular knife. While I enjoy the Burrfection channel on YouTube, this cut test rating is honestly a highly worthless useless piece of unscientific numbers he should be ashamed of ever publishing. In one show he did 5 knifes in a row. In another he did just 1 knife test. He developed stronger muscle memory the more cut tests he did. He has now also in his latest video declared these cut test are useless, which he should have done months ago. Please do not base any what so ever buying advice on such a shady useless at best misinformative test.